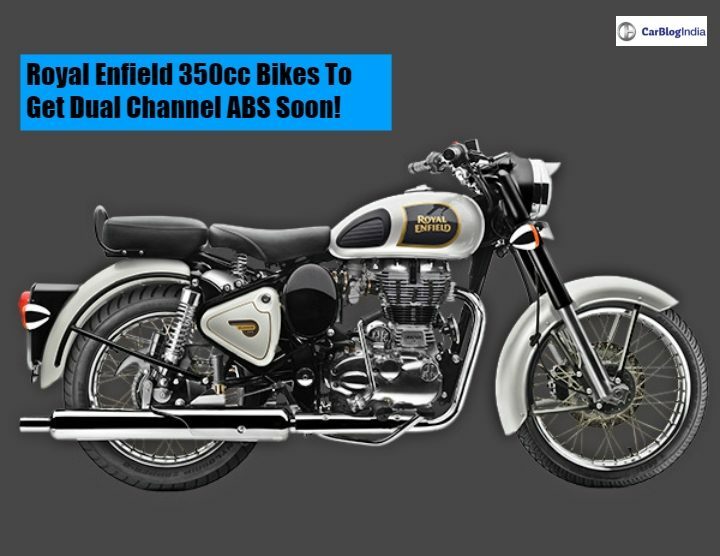 Latest scoop reveals that Royal Enfield 350cc bikes are going to get a Dual-Channel ABS feature soon. That includes Classic 350, Bullet 350 and Bullet ES. Currently, they all come with just front disc brakes as a safety measure. When it comes to cruisers or long-tours, the only thing that comes to our mind is Royal Enfield. A perfect companion for long rides. Latest scoop regarding the RE bikes is that its 350cc bikes are soon getting Dual-Channel ABS feature. This scoop is done by TeamBHP, who has also said that the ABS variants might launch on 27th August. But one thing is strange that the 500cc bikes still will go without ABS, while the less powerful 350cc ones will get it. The Dual Channel ABS might also be for both the 350cc and 500cc bikes. Also, another scoop says that new colour options including matte blue and matte beige might also launch. There is a spied photo which shows the bikes in new colour options. The Royal Enfield 350cc bikes include Classic 350, Bullet 350, Thunderbird 350 and Bullet ES. Currently, they all come only in front disc brake options. The 500cc variants of Classic and Bullet also come without rear disc brakes. Only Thunderbird 500 gets rear disc brake feature. You might be thinking that how can ABS work without disc brakes. Well, ABS technically works with both types of brakes. The major difference is the physical shape and intensity of ABS. While in a disc brake, the intensity and friction are much higher when compared to a normal drum brake. ABS is important for disc brakes but is not necessary for a drum brake. RE 350cc bikes come with the same type of 346cc Twin-Spark Air-cooled engine. This engine produces around 19.8 BHP @ 5250 RPM of power and 29 Nm @ 4500 RPM of torque. The engine is paired to a 5-speed Wet Multiplate clutch. All the bikes get Electric Start and Kick Start, but the Bullet 350 comes only with the Kick Start System. In terms of features, The Royal Enfield 350cc bikes do not have as much as they retain their Retro stance. That’s actually good. In the time of modern features and equipment, it is good to have a retro bike with all these chrome inserts, round headlamps, and analogue speedometers. However, Thunderbird 350 gets the most features with rear disc brake, Always-On headlamps, Split Seats and Backrest. The Thunderbird 350 is priced at Rs 1.50 Lakhs. The Bullet 350 retails from Rs 1.16 Lakhs to Rs 1.30 Lakhs. The Classic 350 is priced from Rs 1.35 Lakhs to Rs 1.47 Lakhs (all prices Ex-showroom New Delhi). Currently, the cruiser motorcycle manufacturer is in news for its upcoming 650 Twins. The Interceptor 650 and Continental GT 650. The GT 650 is a more Street Version and comes with a single seat. Both the bikes are scheduled to launch globally between 22nd-26th September in California. Following which, both the bikes will come to the Indian markets by the end of this year. Currently, the RE Continental GT 535 is retailing, which has been stopped for the global markets.